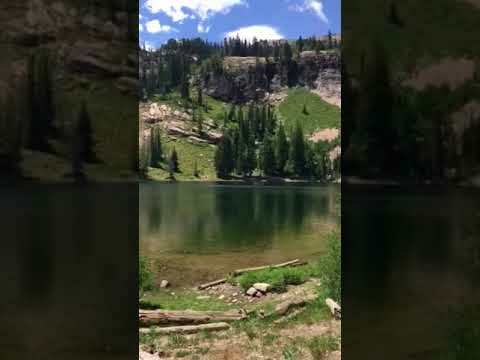 Because I am into hiking and exploring national forest camping this summer, I found a fun adventure at Pittsburg Lake in the Uinta National Forest in the Wasatch Mountains. Getting there—the hike is a 1.5 mile hike up to the lake. Getting to the trail head is a dusty, dirt road behind Midway, UT. You are driving on dirt road for approximately 6-7 miles and will encounter at least two stream crossings. One crossing is cobblestoned, the other is driving up the stream for 50 feet right before the trail head. Therefore, a high clearance vehicle is highly recommended, if not necessary. There are a lot of off roading trails back in this area so you will encounter lots of RZRs, dirtbikes, 4-wheelers, jeeps, etc on your way to the trailhead but a non-lowered car can handle the road if the driver is comfortable. The really rocky section is past the trail head. Anyway, long dusty road to the trailhead then then hike is 1.5 miles all uphill with 1500 ft of elevation gain. You are hiking on a very rocky old mining road. My husband and I decided we wanted to really punish ourselves and we hiked up with an inflatable paddle board in addition to my stuff for camping. The hike is totally doable even with a lot of gear, just go slow and be careful of your footing. To be honest, I felt sorer after the hike down then after the hike up. So you make it up the trail and you come to a beautiful, small alpine lake. The lake is approximately .33 miles around and has trout for fishing. There is even an old homestead cabin to explore. The lake has many human-made fire pits scattered all around depending if you want to be right on the lake or if you want to tuck back farther into the woods. I found a spot close to the lake for easy paddle board access where I could hang my hammock. This was my first adventure in hammock camping and I actually enjoyed it. The views are so pretty and you are on the backside of Snowbird Ski Area. The area was beautiful and I wish I saw more wildlife (I have heard rumors of elk and moose sightings). I am giving this camping area 4 stars not because of the area itself (it is free, beautiful, relaxing, etc.) but because of the other people who were staying up there made it not the best night for a female solo camper with her dog. There was another group camping about 200 meters away but I don’t think they knew I was there and they were up late making a lot of noise. Every time I was about to fall asleep, I would hear them chop wood or yell for an echo or make some other non-natural noise that would keep me awake (plus my imagination would start to run away from me). There was also another couple who decided to camp up there and needed to borrow a lighter but ended up leaving around 2AM. So whenever they came close to my camp, my wonderful protective dog would growl and raise the alarm, again, inhibiting my ability to fall asleep. The other annoyance was the flies. I am not sure if it is just the spot that I chose that had a lot of flies or they would have followed me wherever I set up camp. They didn’t bite and were more annoying than anything. I think my dog ate a few dozen as they buzzed around her head. So due to those negatives, the spot gets dinged a star. Overall, it was worth carrying the paddle board up to the lake as I was able to relax and float and tool around. You can’t go very far but being on the water is always a good time. I could read my book in the hammock and go for exploratory hikes in the area. Final thought, it is National Forest camping so please, please, please follow leave no trace principles to keep the area nice for future visitors. As a Ranger for The Dyrt I get the opportunity to test out gear from our awesome partners once in a while. 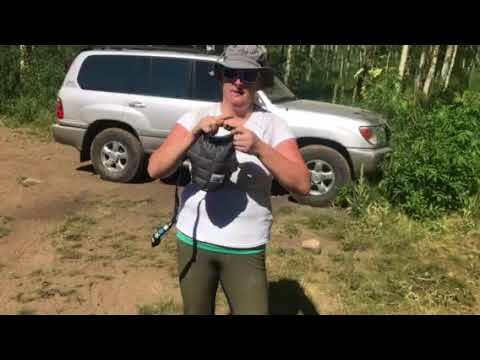 While I was camping at Pittsburg Lake, I had the opportunity to try out the Matador Camera Base Layer. Because I am a glutton for punishment, I decided to haul a bunch of gear up to Pittsburg Lake and it included by nice DSLR camera. Photography is a fun hobby I have been playing around with for a few years, but I come across the problem of how to safely get my camera places without carrying either an additional camera bag that takes up a lot of space or wrapping my camera up in a sweatshirt or other piece of clothing to protect it with a smaller profile. Well, the Matador camera base layer has officially solved my problem. Hooray! The base layer is basically a padded, contoured, dry sack for my camera. Place the camera lens down, then roll and clip the top like a dry sack. It has holes to allow your camera neck or wrist straps to come through so you can wear your camera while it is being protected. Because it is from Matador, it is super lightweight but it does not feel flimsy, thin, or not durable. I was able to stuff my camera in the top of my paddle board bag while hiking up and down and I felt comfortable that nothing would be broken when I got to the top. It protected it from the dirt and dust that gets on everything when you are camping so it helped to keep things cleaner. I also took my camera for a hike with no additional backpacks and I clipped the base layer around my wrist so it wouldn’t get in the way. Besides being a bit hot, it was a great way to keep track of the base layer. I cannot convey how happy I am to have this piece of equipment in my gear box. While I am no Ansel Adams, being able to take more pictures with my camera and not just my phone while I am out on adventures will add another dimension to my activities and help me develop a new skill. The only thing I might want to improve is a small piece of Velcro on the bottom to help keep the waterproof cover inside its little pocket. But this is so minor in the grand scheme of things. If you are into photography at all, I highly recommend looking into this product.